Collecting yellowware has been a passion of mine for a number of years now. I can still remember purchasing my first bowl at an antique fair in Haddonfield, New Jersey over a decade ago. It happened by chance, really. As I was making my way through the stalls, looking over mismatched sets of jadeite, piles of old linens and whatnot, I noticed a vendor with a gigantic yellowware bowl. The bowl beckoned me to give it a second look and that’s exactly what I did after making my rounds. While negotiating the final price of this gem and thinking how I would integrate it into my home, I placed it in one of my canvas totes and walked home with it in tow. What you must understand is that I have a penchant for bowls, mixing bowls that is. When it comes to yellowware bowls, however, nothing brings the colors, tones and atmosphere of autumn into my kitchen like they do. Over the years I have photographed a part of my collection here on Good Things by David, styling certain posts and write ups with them in my background or as the actual vessels helping me with my mise en place. Yellowware originated in England in the late 18th century and potters skilled in its construction who emigrated to United States began production here in earnest throughout New Jersey, Pennsylvania, Maryland and the Ohio river valley in the early 1800s. 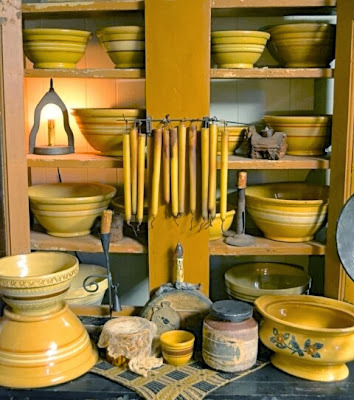 By the mid 19th century and well into the early 20th century, yellowware was found in many kitchens throughout New England as a result of its durability and affordability. Characterized by its distinct, yellow-firing clay taken from rich riverbeds in the Northeastern part of the United States, most pieces were given simple decorative elements while others were left unadorned with a clear glaze. Its colors and hues are unmistakable to the collector. Items such as strainers, baskets, pie plates, milk pans, molds, funnels, mugs, custard cups, bowls and baking dishes, all of which catered to specific kitchen tasks, were made into yellowware. It was the tupperware and Pyrex of that era. By the Depression, however, yellowware fell out of favor and glass became the medium of choice for kitchenwares. A cabinet in a colonial kitchen shows pieces of this yellow earthenware spanning several decades. For the collector, finding these pieces can not only be a challenge, but it can be a rewarding scavenger hunt when one least expects it. 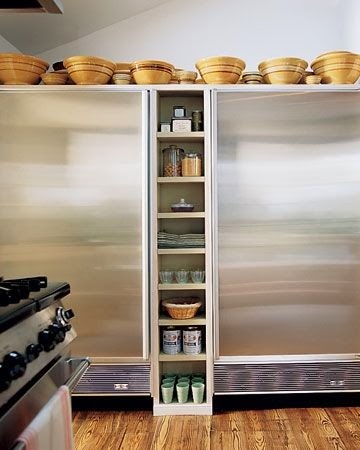 were kept above the refrigerators of the main kitchen. Decades ago, this type of earthenware was selling for mere dollars, but with the rise in popularity for things made from yesteryear, the value of certain vessels have soared astronomically. I usually don’t go into antique shops with the intent of purchasing this type of earthenware, because my interests in collecting are broad, but when I do come across something which catches my eye, I pause to examine it. If I find it to be suitable to my sensibilities, my tastes and my kitchen, I will set it aside for purchasing. If you collect yellow ware then you understand where I’m coming from, but if you have never laid eyes on this former kitchen workhorse of Americana, then I invite you to examine it. When I first get my bowls out of storage, I place them on my dough counter to inspect them and see if they need cleaning. Cardboard and felt inserts are placed between bowls if I'm stacking them in order to prevent chips and cracks. An overview of other mixing bowls getting ready to be displayed. That corn mold in the foreground is one of my favorite pieces. On one of the metro shelves in the kitchen, I display some of my bowls of various sizes on the upper tiers. Not only do they look nice set against the cream-colored walls, they are at the ready should I need them to bake large batches of anything. On this particular autumn day, I was setting out to make a dozen tasty apple muffins. Here I have a mix of yellowware, Taylor custard cups and some British custard cups that always sit on my 70 spice rack. This photograph shows me mixing buttermilk with grated apples. So delicious. A bowl lined with a dark linen napkin is full of warm muffins straight out of the oven. A small yellowware bowl filled with molasses-sweetened whipped cream cheese is set out for spreading onto the tops of the little morsels. You'll notice how my Wedgwood drabware mixes so naturally with the tones of the earthenware. A pudding mold filled with Araucana eggs. Baking doesn't get any better than this. If you find yourself wanting to collect this earthenware from centuries past, visit some antique shops, antique fairs, flea markets and auction sites to get better acquainted with it. Be prepared to pay a princely sum for the best specimens, but keep an eye out for those pieces that don't cost a lot. Yellowware's beguiling attributes are bound to become some of your favorite pieces in your very own home. Oh, my! I'm going to need a barn, too! Glimpses into your kitchen are always such a treat, David! Your collection of yellowware is stunning - I know it's not nice to be envious, but I cannot lie... I know how much effort it takes to acquire such a collection; therefore, I do envy yours! Happy Baking and thank you for another wonderful post! Thanks! Yes, you're absolutely right. This type of collecting does take time and dedication. For me. . It's a toss up. Which I like best? Jadeite or yelloware? David those bowls r beautiful. Like u. I have an obsession for heavy yelloware mixing bowls. Martha says not to use them for actual cooking or serving...they are heavily leaded!